Ok so I recently updated my Verizon S7 Edge to Nougat. Before, I could fully charge my watch, take it off the charger, leave it off and when I get up for work I it would use about 40% of the battery by 8 pm. Well this morning I did my usual routine and at 3 pm the watch was completely dead. I know something is up because this watch could last 2 days no problem. Anyone else recently switch to Nougat have this issue? I had a nexus 6P on nougat with no issues at all. Have an s6 edge connected now but still on marshmallow so can't say how the Samsung stuff works on nougat but prior experience was just fine with the 6P. I've had mine since November and on 3 or 4 occasions I caught my watch draining incredibly fast and every time the Gear app reports 70-80% of the battery is used by Watch faces. In all cases a restart of the watch fixed the problem. This happened a few times with Marshmallow and once with Nougat (I also have a GS7E) so my problem doesn't appear to be Nougat related. But you might check to see which process used up all of your battery the next time it happens. ive only had my s3 for a few weeks and get maybe 3/4 of a day if lucky.. today off charger 6 AM 13% by 5 PM.... its LTE version and have turned off most everything including the health stuff.... im at a loss.....!! That's terrible. When you look at the battery usage does anything jump out as abnormal? 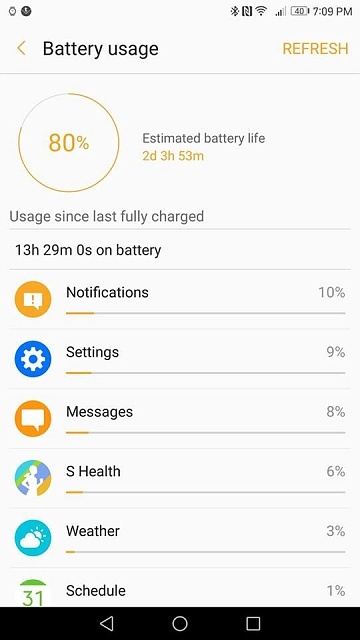 Are you experiencing this battery drain with LTE turned off? If yes then some app or watchface is messing something up. Do a factory reset and use it a few days without installing any apps. If LTE is on, then it's likely you're in an area with weak signal strength, and the watch's battery is used up trying to connect to the network. Ok its safe to say my LTE with my weak signal was killing my battery. today off charger at 6 AM and as of 12pm 'm still at 93% battery. so i'm right at that 2-3% and hour range. BT on WiFi and LTE off made a few calls and about 20 or so text.... i'm happy !!! That's good it worked, mine has been fine for the last 2 days since I posted this, I am keeping my eyes on it just in case it goes crazy again. Nougat badge notifcations wont go away and other issues! Lg G5 problems after nougat update?